Cherice J. Williams is a strategic, consumer-centric marketing leader and people-grower with award-winning ability to increase consumer engagement and build brand relevance across various categories, industries and Fortune 500 Corporations, including Target, Pizza Hut, Miami Heat, Proctor & Gamble, Hershey’s, and BOTOX Cosmetic. Cherice holds a B.S in Political Science from University of Michigan, and MBA in Marketing and General Management from University of Miami. Her passion for marketing isequally matched with a commitment to empowering women and moms to turn their passions into thriving businesses. She independently coaches fellow entrepreneurs on conceptualizing their business ideas and building strategic marketing plans on a cost and time-effective scale. 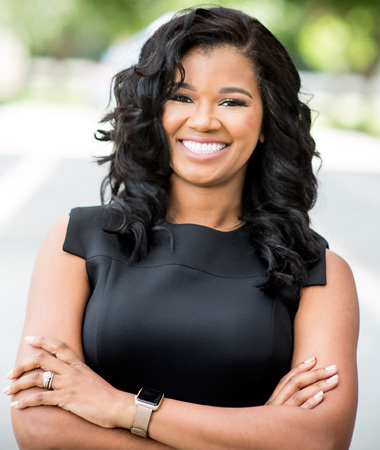 Cherice also currently sits as the President of the National Black MBA Association® | Dallas Fort Worth Chapter – an organization focused on facilitating connections and growth opportunities between DFW African-American professionals, Fortune 500 corporations, and the community.